Yet when a stranger arrives, a long held family secret could silence the bells ringing for the Muir sisters. Scandals surface, family bonds are questioned, and promises are broken and renewed. It was with much excitement that some of we readers learned there was a fourth book set in the lowcountry, with the three Muir sisters and Mamaw. Harper and Carson are in the final count down to their weddings. Dora had seemed all settled and all was well. Or so we thought. However life does go on, and we were taken further along on the journey. I had listened to the first three in this series on audiobook and loved the narration by the author. However I couldn't wait when I saw this one, I wanted to get down and read it. I love the description of the setting, all the sights and sounds of that part of the world. Mary Alice Monroe certainly takes a surprising step in this book, I really don't want to say any more because to do so would be to spoil the surprise for other readers. I can only say I loved the surprise, and while the sisters found it hard to come to grips with it, what a gift for them. The book covers the two months lead up to the wedding and all that goes on before a wedding. Finding the right dress and making the final decisions about the venue. Harper and Carson seem to have got mixed up and oddly are planning a wedding that the other would be more comfortable in. All three sisters are still dealing with issues and growing through them. Harper has money and how does that leave Taylor feeling? Carson wants to know she has work and will never be without it. Dora is on the verge of a new job and a newly minted divorce. She wants to prove her independence and ability to prove herself much to the chagrin of Devlin. So you see, plenty of ways all this could go. I wondered if there would be a wedding by the end and would Mamaw survive without a hear attack! Lastly but not the least, Delphine makes some appearances - significant ones and she also has the honor of the epilogue. Perfect. This series is delightful and I just hope there might be one more! I found Mary Alice Monroe because I have an aunt named Mary Alice, and I've always been glad for that serendipity. She's great (well, both of them are)! Yes actually it is rather a nice name isn't it! Good books always a blessing. I need to read this series. Love your review. It is worth reading Mary. Kathryn I LOVE low country novels and this one especially with your Fantastic review is going on my list! I know funny, I like them too for some reason and I have not been thousands of miles near the place! I read and loved the first two books...and have Summer's End waiting for me on Pippa. So I should hurry and read it in order to move on to this one, which sounds wonderful. Can't wait to find out what the surprise is! Thanks for sharing. Ah yes, Laurel-Rain what a surprise this one was, especially too as we thought it would be just a trilogy! This is a series I definitely want to read. It is just perfect summer reading Stefanie. This sounds so fun! I haven't read anything by this author yet but this series is high on my list. I love the idea of the sisters and being able to follow the story throughout these books. Yes it is one that should be read in order as the development of the characters takes place over the novels. Well worth reading. I loved first three novels in this series. 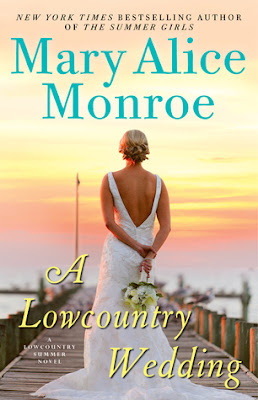 I will add A Low Country Wedding to my ToRead list. I'm glad you enjoyed. Thanks for your terrific review!